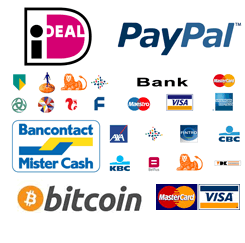 You can pay with iDeal, Paypal, Mister Cash, SOFORT Banking, Bitcoin or use a direct Bank Transfer. This payment method is available to anyone with a Dutch bank card. This payment method allows you to process the payment with your own bank. You pay in your trusted internet payment environment based on specific security methods from your own bank. With PayPal, you have the freedom and flexibility to pay the way you want, all while keeping your financial information secure. Mister Cash is a payment system in Belgium and was developed in 1979 by a collaboration of three financial institutions, CGER, BBL and Credit Bank. It is similar to the Ideal payment system in the Netherlands. With SOFORT Banking online shopping payments has never been easier! You can use your own online banking login details – convenient and secure. And thanks to the transaction confirmation your order can be processed immediately. Look forward to speedy delivery! SOFORT Banking is a populair payment system in Germany. Pay with the virtual currency Bitcoin. Bitcoins are the new cash. Bitcoin is electronic money that you can use to send money to someone without a financial institution such as a bank, or you can use to pay. Paying with Bitcoin is easier and safer than cash, debit or credit card payments. During checkout select the payment option ‘Bank Transfer’. Your bank transfer is being handled by our payment provider ‘Mollie’. Within 24 hours after receiving your payment, your order is shipped. You will always receive notice of this. If we do not receive your payment after 12 days, your order will automatically be canceled. A bank transfer takes time to process. Your order will remain on hold until your payment is received and processed. Please allow 2 to 3 days additional delivery time. Do I have to pay 21% VAT? Are you located in the Netherlands? Then we will charge 21% VAT. Is your company located in the EU (except the Netherlands)? If you enter your Captive data and a valid European VAT number, then we will not charge VAT. An order can be delivered on account, however, this only applies to government agencies, TQC customers and re-sellers. To deliver on account an application shall be submitted. Copyright © 2019 TQC Sheen B.V.